A March 7th Channel 4 News video segment by international editor Lindsey Hilsum failed to challenge the narrative that Palestinians are being unjustly evicted from their homes in east Jerusalem. 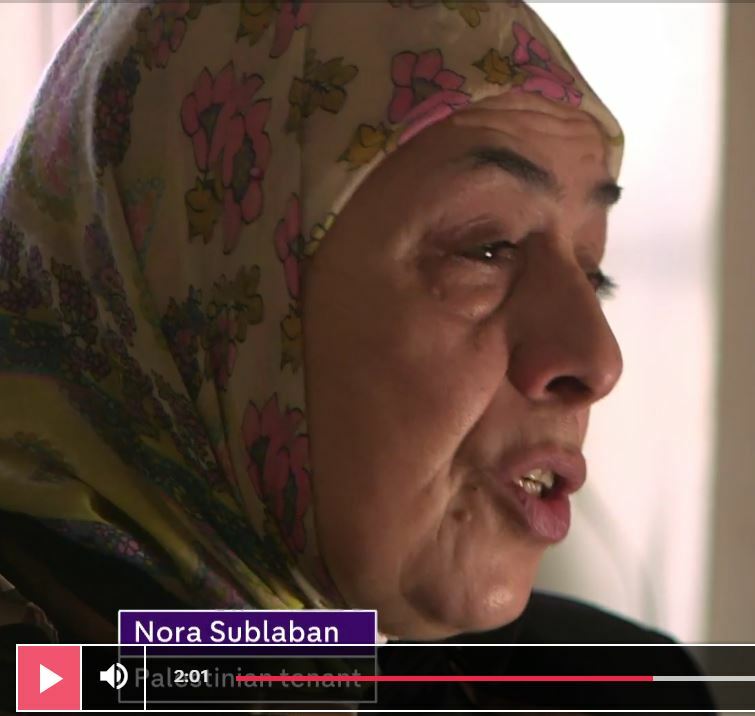 The segment – loosely centered around British foreign secretary Boris Johnson’s recent trip to the region – included an interview with a Palestinian woman named Nora Sublaban. Sublaban suggested that her family was being evicted by Israeli authorities for no good reason and that she’d lived in the apartment her entire life. “All of my memories are here”, she explained to Hilsum. However, that’s not accurate. How do we know this? The Sub-Labans were at one time long-term tenants of the property in question, and under Israeli law enjoyed “protected tenant” status. That status can be lost if the tenant abandons the property without intention of returning – and this is true whether the tenant is Jewish or Arab. The crucial fact – which Hadid omits – is that in 2001 the family left the property and moved elsewhere, which is why their right to continue renting the apartment has been challenged. • A (Jewish) neighbor living in the apartment opposite testified that no one had lived in the Sub-Laban’s apartment during the years in question. • The store (part of the property) was for many years unlocked, and its door was broken. • A phone was only installed in 2010. • The Sub-Labans didn’t call any witnesses to testify that they were living in the apartment despite the fact that many neighbors and family members could have theoretically been called. • A private investigator testified that he had interviewed neighbors and none of them knew the Sub-Labans. The court found in 2014 that for 30 years, since 1984, the Sub-Labans have been living with their extended family in another apartment. After reviewing CAMERA’s evidence, the NYT amended the original article and added a lengthy editor’s note clarifying the circumstances surrounding the claims of Nora Sublaban and other Palestinian claimants. We’ve tweeted the Channel 4 News editor and emailed producers asking for a similar correction.